Only work with people who are committed to change and make use of what you teach. Get higher word-of-mouth referral rates from existing happy customers. Provides a balanced energetic relationship with the people you work with. Earn a good income from doing the work you love. Get a return on your investment from training and graduating as a Calmologist. I have noticed that the more I charge, the better the results my clients get. It is a fascinating phenomenon. I started off charging £45 per session and had a challenging time with my clients. They would talk for hours about their story and did not appear to want to move on. Then I increased my price to £75 per session and the results improved. Then again I increased my consultation fees, this time to £150, and guess what - the results became even better and the clients I attracted had a different level of focus and commitment. Since increasing my session rate to £297, I’ve had more repeat business and the results have been remarkable! When clients meet with me, they waste no time. They want to learn and resolve things quickly and move on with their lives. They are also more willing to apply what we talk about between sessions. It is for this reason that I encourage you to charge a higher fee for your Calmologist services, whenever possible. You can always offer concessionary discounts to those with a genuine need but not the means. Offering a higher rate, also gives you price flexibility too, enabling you to do ‘flash sales’ and still earn a fair rate. Due to the nature of Calmology, I recommend offering packages of 4-6 sessions and charge a fee that feels comfortable for that amount of time and exchange of expertise and energy. 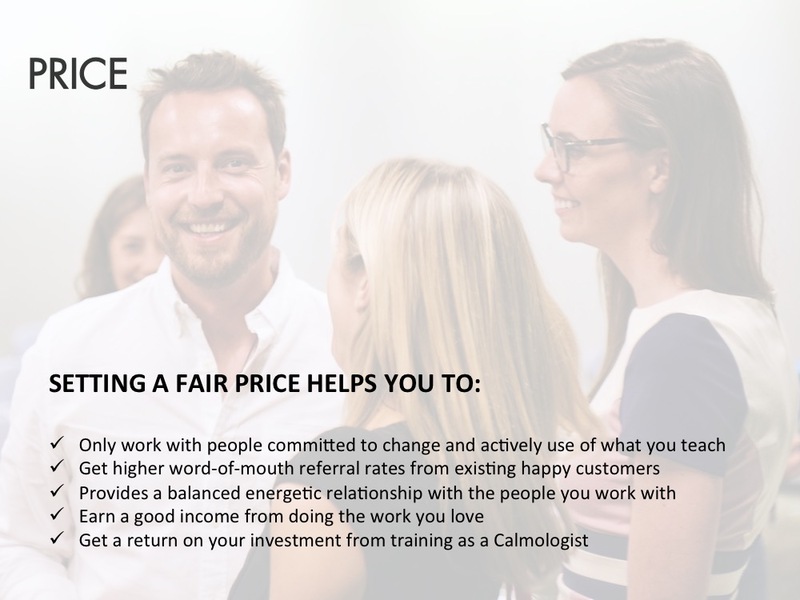 The recommended package price is anything from £195 to £345, depending on your personal motivations, location, expenses, experience and expertise outside of Calmology. If you feel uncomfortable charging, say £300, then perhaps you would prefer to offer a discount for people on low income or the unemployed. For example, you could offer two rate, £300 or £150 with the lower amount being for those on low incomes and leave it up to your clients to decide which category they fall under. Either way, people will know you're not 'in it for the money' because you offer concessions for people with limited access to funds. You may want to decide how much income you would like each month/year and how many people you want (and can realistically) work with. If you divide the income by the number of people you will find out how much you need to charge. This is a far more effective pricing strategy than compared to plucking a price out of thin air and hoping enough people will be interested in working with you so that you make enough to pay the bills. I have set up my business to benefit from multiple streams of income. Having multiple sources of income enables you to potentially earn less from each source, yet still end up with a healthy income at the end of each month/year. For example, my business consists of online mentoring sessions, courses, talks, retreats and products. Each provides a way for me to connect with a range of people and together adds up to make a healthy income from the work I do. When setting up your business, it can be very useful to explore offering a range of different formats. Some people will want private one-to-one consultations, while others will find a private clinic too daunting (to start with) and will be delighted to see you offer group courses or products. Other people will prefer the exact opposite. By offering a range of service formats, you can appeal to a larger audience and make a bigger income from the work you do. Variety is a high value of mine, so having a business model that allows me to be creative in a number of different ways works well. I am never chasing mentoring clients and find that the different offerings all feed each other. For example, if a person buys a product, they are highly likely to attend a clinic, retreat or participate in a course. This means, one person will buy multiple products/services and as you may already know, it is easier to sell to current clients than always have to find new ones. NOTE: As a Calmologist you are permitted to offer one-to-one mentoring services using the Calmology principles and techniques and run live courses or retreats sharing Mind Calm and Body Calm meditation. You are not qualified to teach Calm Cure or Mind Detox live courses or offer online courses solely on Mind Calm, Body Calm, Mind Detox, Calm Cure or Calmology. You are allowed to offer different themed online courses, which incorporate what you’ve learnt during your Calmologist training. Whenever sharing/teaching Calmology principles or techniques, give credit in the marketing materials and when teaching i.e. 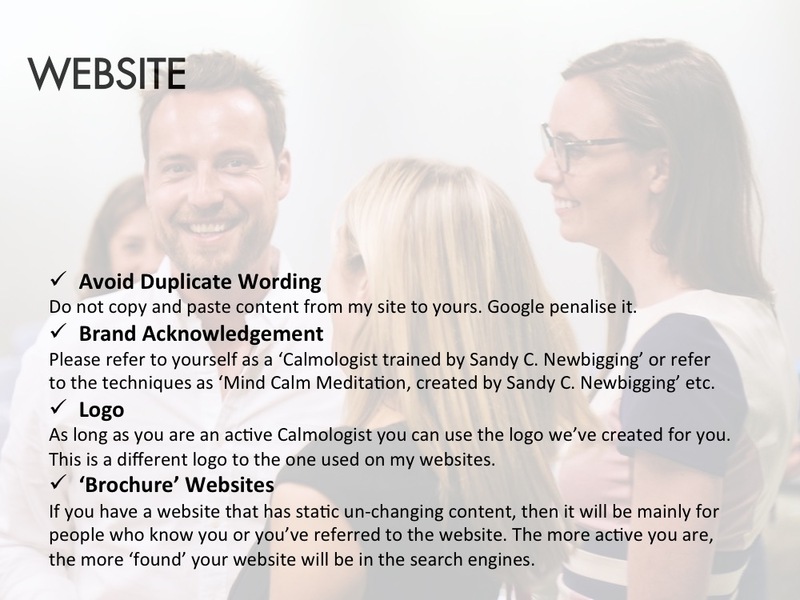 ‘I am a qualified Calmologist, trained by Sandy C. Newbigging’ or ‘During this weekend course you will learn Mind Calm, created by Sandy C. Newbigging…’. Please do not imply that you created the Calmology techniques. If in doubt, please ask. When designing your business, it is great to start by considering the kind of life you want to live. Personally, I want freedom to travel, the time to be creative, to work as part of a team and share the success so that everyone wins. These are my core values that have, for example, caused me to create online courses, offer online mentoring services and set up the ‘home study’ academy - so that I am working with coach trainers and sharing the success by paying them to support the next generation of Calmologists. Setting my business up this way allows me to have the space I need to write books and spend time anywhere in the world because I'm not fixed to any one location. So I recommend you design your business based upon your own personal values and shape your business to support it. It is very important that you focus on selling the value of the results people will get, rather than attempt to sell an 'hour with you'. If a person works in a shop they might earn £15 per hour, if they do massage they might earn £45. If you then say an hour with you costs £95 then you might find potential clients question your price. However, if you find out what your potential clients wants to work on and then offer Calmology as a potential solution to their problem, you will find it much easier for your clients to see the value in what you are offering. Let's say a person has been suffering every day for the past 3 years because they cannot sleep. How much do you think that person would pay to be free from insomnia? A coaching package of £300 is a small price to pay for freedom from the discomfort of not being able to sleep, for example. Or what if the person you meet keeps creating relationship problems and is about to have a divorce. They may be facing their family falling apart, their kids going through a traumatic break-up of their parents, lawyers fees, moving costs and splitting financial assets with their soon-to-be ex-wife or husband. £345 for a Calmology Mentoring Package is a very small price to pay if they could get peace with the past and move on without a messy (and expensive) divorce. 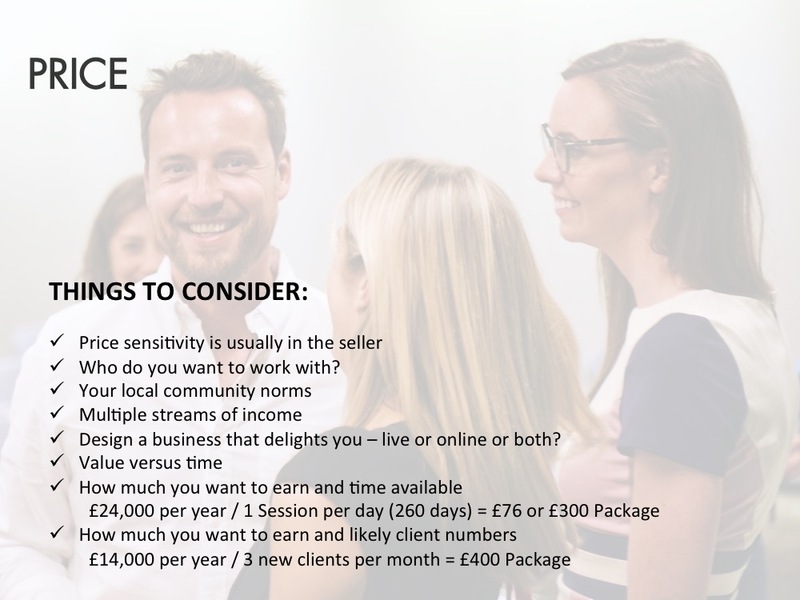 These are just two common examples that help to illustrate the importance of focusing on the value you can offer potential clients, rather than attempting to sell an hourly rate. It has been said that 'price resistance is always in the seller, not the buyer' and this is very much my experience. It is important that you charge a price that you are comfortable with. At the same time, if it is much lower than the industry norm then you might also want to explore whether you have any 'issues' linked with money matters. I have found that since I became fully congruent with the prices I charge, the less resistance I have from potential clients with regards to my price. 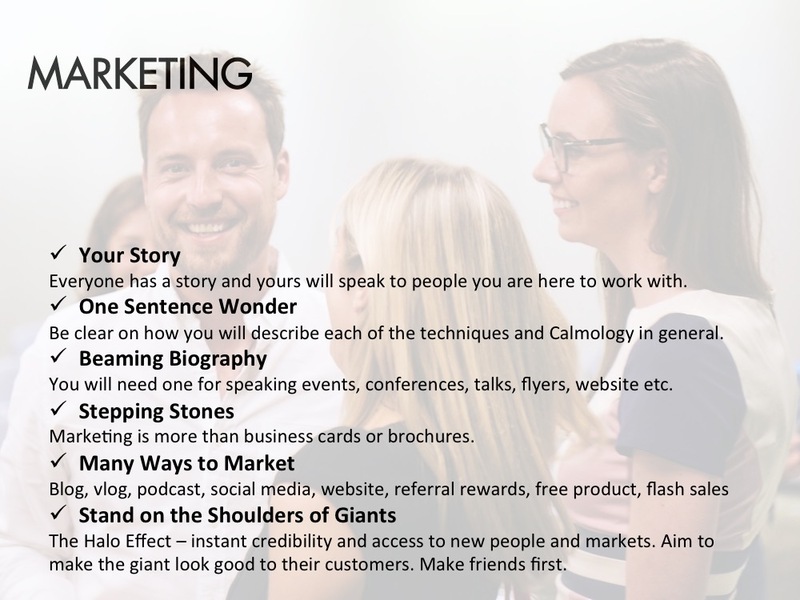 Overall, it is possible for you to earn a good income from Calmology Mentoring and Courses by focusing on the value delivered and charging what you and the techniques are genuinely worth. GET YOUR ELEVATOR PITCH READY... NOW! Knowing your One Sentence Wonder makes you more trustworthy from your first interaction with potential clients, and saying as most people you meet will form a judgement about you within the first 10 seconds, it helps to ensure their opinion of you is positive. ‘Calm Cure is a way to get peace with the full spectrum of life - so that you resist less and can be happier more often’. ‘Calmology is the study of Self Awareness for the cultivation of inner calm, stillness, holistic health and ‘peace with life’. Choose the One Sentence Wonder that you feel would resonate best with your prospective client. YOU ARE MORE FABULOUS THAN YOU MAY THINK! Your biography is a brief summary of your credentials, including your relevant qualifications, professional endorsements, published work, your specialities and any other useful information about you that will make you appealing to potential clients. A beaming biography opens doors. It summarises why someone would want to come to your talk, attend your workshop, publish your work in their magazine and/or book a coaching package with you. Businesses you own or are involved in to demonstrate you are a big player in the industry. Then, once you have your list, highlight the top 5 best credentials and bring them together into a coherent paragraph that will make potential clients and event organisers feel lucky to work with you. "Sandy C. Newbigging is the creator of Calmology, a meditation and mind-body connection expert, multi-bestselling author, mentor and monk. His Calmology techniques have made meditation fun and beneficial for thousands of people worldwide and he is widely respected for his unique ability to discover and resolve the real root cause of chronic conditions and persistent problems. His work has been seen on television in 30+ countries and his last six books have become no.1 bestsellers. Yoga Magazine declared him as 'one of the best meditation teachers around', Red Magazine acknowledged him as ‘the guru of modern-day meditation, and The Times said ‘Sandy is pioneering mind-body detox’. The Evening Standard also recently listed his Body Calm book as ‘one of the best mindfulness and meditation books’. Via his academy he’s personally trained practitioners in his methods from 20+ countries and appears on radio stations across the UK and USA. Sandy’s message is profound, yet simple - peace is possible and the solution to all problems." Although you’ve trained in the ability to share some really powerful techniques, people don’t want to buy techniques. They buy the person sharing the technique, which is you. When a person is deciding if they want to pay you for your advice and guidance, they are going to largely base their decision on if they see you as an inspiring person who is experiencing what they want. If you are ever finding ‘business slow’ then you need to have a look in the metaphorical mirror. Would you hire you? Are you living an inspirational life? Are you living the teachings that you want to teach others? Would someone look at you (and the way you are living) and want to be like you? Do they want what you have? Are you tired, stressed, moaning, moody, worrying, gossiping, thinking lots etc.? Or are you radiating aliveness, peaceful, present, still, kind, happy, loving life etc.? Avoid blaming the economy, price, time of the year, your marketing skills or social media numbers, or other people’s not being ‘ready’ for what you offer. Be the change you want to see in the world. Live the teachings and embody the techniques and soon clients will come knocking. A person doesn’t necessarily want to buy a drill, they want a whole in the wall. In other words, they don’t necessarily want techniques, they want what the techniques will give them. For example, it is good to advertise that someone will learn ‘Mind Calm Meditation’ however, make sure you focus more on the problems the technique solves and benefits and value gained from using Mind Calm etc..
One of the key marketing strategies that I've adopted to progress within my field is to stand on the shoulders of giants. In order to do this, I've looked for alliances and institutions in the market place who have a large network of people interested in the products and services I provide. When adopting this strategy, you are not looking to take clients, but instead, bring value to clients that you want to gain access to. This way, you are not seen as a threat, and instead, you are welcomed with open arms because you can make them look good to their network of people. These days I rarely run events that are not being hosted or run in association with bigger players in the local community. I do talks and courses around the world, but it would not be possible without standing on the shoulders of the networks of the alliances and institutions that I work with. Over the past few years I have approached and built relationships with the main health conference organisers throughout the UK. By nurturing these relationships, I have now got to a point where I am invited to these events and more often than not don't even have to pay to have a presence at the key UK conferences. Before approaching any local and national institutions, make sure you do your research. Read their website and see what is already being offered so that you can suggest the right talk or offering that would appeal to their network. Make sure you remember to focus on how their network can benefit from your services and how they can look good to their clients by having you work with them. Think win-win. Most people's buying strategies are driven by emotion. As a result, you want to ensure that your potential clients and audiences become emotionally engaged with what you are offering. Highlight the problem that you have a solution for. For instance, this could include talking about the large number of physical conditions that are potentially caused by stress and negative emotions. For instance, Dr Bruce Lipton suggests that 95% of all physical conditions are caused by stress in the autonomic nervous system. This means, that even if you do your best to exercise and eat right, if you have unhealthy beliefs or unresolved emotional baggage, then optimum health and happiness may continue to elude you. Better health, wealth and happiness is possible if you make it a priority to discover and heal the mind-based causes of stress. Share inspiring stories, either based upon your own life or the lives of your past clients, that show how it is possible to move away from pain, ill health, feeling bad and persistent life problems. Share your credentials so that your potential clients believe that you are able to follow through and deliver what you are saying is possible. Ideally, back your stories up with science, statistics and practical theory that encourages your potential clients to believe that what you are offering can genuinely benefit them. Offer an incentive or reason to buy sooner rather than later. Remember, for every day that passes since your potential client has spoken to you or seen you speak, the odds off them buying your products or services reduces by 50%. Avoid people going home to 'think about it' because they will likely get distracted, forget about you or buy someone else's product or service. You may want to offer a 'free' gift upon booking, or a 'limited time only' discount, or reduce the availability so that there are limited spaces / products. Whatever you do, remember to 'close the sale' by setting clear parameters on WHEN they need to buy - and make it clear that if they don't buy now, they will most likely miss out. DOES THIS ALL SOUND TOO SALESY? It need not be. You can be very relaxed, informative, and entertaining with the stories and anecdotes that you share. The key is to speak from your heart and genuinely care about helping others to enjoy better lives. And don't forget, the people you are going to work with are going to benefit massively from what you have to offer them. Ultimately, they want what you have to 'sell' - they just need to know that you have what they are looking for. What was my rock-bottom wake up call? By this, what bad things happened in my life that motivated me to search out a new way of thinking, feeling and living? What did you want to let go of? ... negative emotions, unhealthy habits and behaviours and/or negative life circumstances? What did you want to gain? ... positive emotions, healthy habits and behaviours and/or positive life circumstances? How did what the techniques that you have used help you to improve things? Where are you today and how is that different to where you started? Why is what you've done possible for your potential clients too? 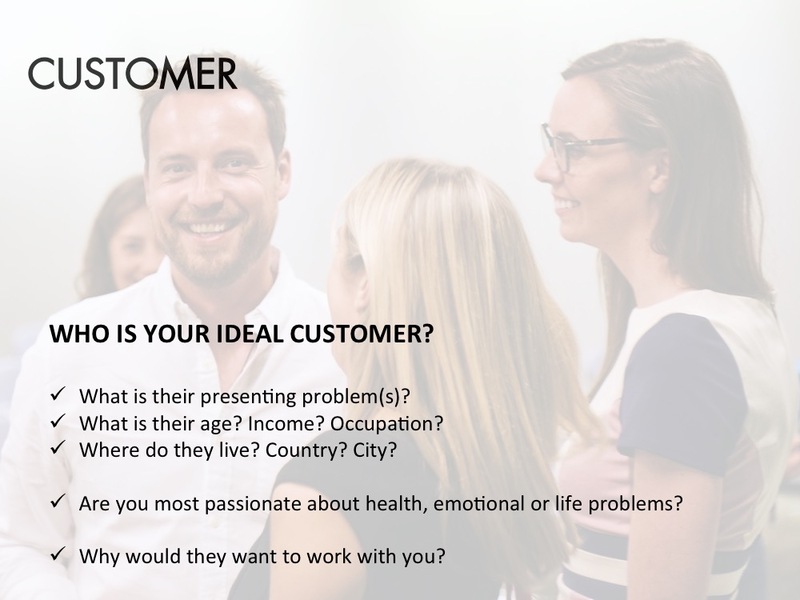 Ideally, you want to share your inspiring story including relevant supporting science, statistics and theory - all in a way that causes your potential clients to experience the four emotions that sell.